For the X Board arcade game, see GP Rider. For the Sega Game Gear game, see GP Rider (Game Gear). 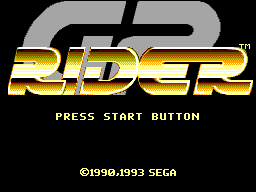 GP Rider is a racing game developed by Sega for the Sega Master System. It is loosely based on the 1990 arcade game of the game name. The Master System version of GP Rider is similar to the older release of Hang On, however features more modes of play and is permanently viewed in split-screen (much like the Master System version of Super Monaco GP. Main article: GP Rider (Master System)/Magazine articles.